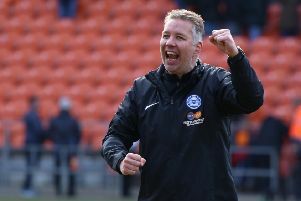 Peterborough United are today (October 9) conducting three ket fitness tests ahead of their League One match at struggling Swindon tomorrow (October 10). Midfielders Michael Bostwick and Chris Forrester and star attacking talent Marcus Maddison are the men under the microscope after missing traiing sessions this week. But there was better news on the goal-keeping front as captain Ben Alnwick looks set to play after recovering from the back injury that forced him off the field after just 30 minutes of last Saturday’s (October 3) thrilling 5-3 win over Millwall. Maddison picked up an ankle injury in the Millwall match and he is thought to be the biggest concern of the three fitness doubts. Teenage midfielder Jermaine Anderson is available again after serving a three-match suspension. Fellow midfielder Erhun Oztumer remains suspended. “Ben looks like he will be okay. He has one hell of a bruise and he suffered some bleeding over the weekend, but they breed them tough up north. “It’s good to have Jermaine back. He was playing very well before his suspension. He has energy, enthusiasm, drive, attacking thrust and he’s good on the ball. If he can just add an end product he will be even better. There has been no further movement yet on the possible transfer of 18 year-old Posh ‘keeper Dion-Curtis Henry to Leicester City. Henry trained at the Premier League club this week after making his Posh debut as a substitute against Swindon. Westley added: “Some-one of Dion’s size with his ability will always attract attention and I wouldn’t be surprised if something concrete happens. Swindon are short of players and completely out of form. The Robins could be missing up to 10 senior players tomorrow, although chairman Lee Power, a former Posh striker, was hoping to sign a couple of defenders on loan before tomorrow’s match.